April 11 is World Parkinson’s Day and across Scotland more than 70 landmarks will light up in blue to show solidarity with the 12,400 of us who live with the condition in Scotland. Parkinson’s affects about one in 375 adults here – making it the second most prevalent neuroprogressive condition after Alzheimer’s. Most people have heard of Parkinson’s but other than Sir Billy Connolly having it, what do we really know about it? 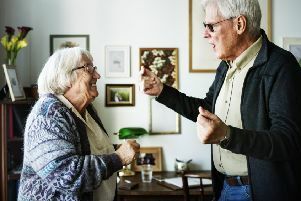 The perception that Parkinson’s is an inevitable part of growing old and is just a bit of shakiness couldn’t be wider of the mark. Parkinson’s can be brutal and has more than 40 recognised symptoms. It affects people of all ages, and typically has a massive impact on every aspect of someone’s life. I’m already noticing that my Parkinson’s gets worse as time passes, and it is currently incurable. That’s why Parkinson’s UK is investing in pioneering research in Scotland and around the world to deliver better treatments and a cure. While we wait for a cure we need to be sure that services and treatments are of the highest quality and accessible to everyone with Parkinson’s wherever they are in Scotland. Our symptoms and the severity of our condition means we are heavily dependent on the NHS. People with Parkinson’s are amongst the highest users of NHS resources but, as we reported earlier this year, services are patchy and something of a postcode lottery. There aren’t enough specialist nurses or consultants. And the quality of information, support and access to therapies varies considerably around the country. Every bit as important as improved health services is better public awareness and understanding of Parkinson’s symptoms and what it’s like to live with this condition. It’s embarrassing when people stop and stare or confuse your unsteadiness with being drunk. It’s not easy to keep explaining that your expressionless face is because of Parkinson’s and not because you’re thrawn. It’s unhelpful when people don’t believe there’s anything wrong with you or show impatience and don’t give you just a little more time. Thankfully most people are considerate. But those negative reactions, which we’ve all experienced, can really inhibit people from going out and living as full and independent a life as possible. To improve public understanding Parkinson’s UK is using World Parkinson’s Day to launch Parkinson’s Is, a campaign to show the reality of life with Parkinson’s. The campaign will show the brutality of Parkinson’s and demonstrate how people with Parkinson’s don’t let it hold them back. Parkinson’s is a serious health condition and it’s incredibly challenging for those of us who live with it, and also for our families who have to live with it too. It can be terribly isolating and that’s why the Parkinson’s community across Scotland really appreciates initiatives like the light-up project – it means so much just to know that people care and are aware of the condition.